Ronald March 15, 2013 Adding Topics View Counter in BBPress2013-03-16T02:29:04+08:00 Topics: How To. 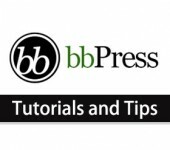 Subjects: BBPress Tips and Tricks and BBPress Tutorials. BBPress is a WordPress Plugin alternative to other Forum Software such as vBulletin, phpBB, Xenforo and Vanilla. Although BBPress did not have as many features like vBulletin and Xenforo, it had a more higher Search Engine Optimize score than both of them plus BBPress is Free to use. BBPress use WordPress Permalink which are Better SEO Friendly, many webmaster are taken interest in using BBPress as their Community Forum Tool. Today i am going to show you how to add a view counter to BBPress topics. First, make sure you have BBPress plugin installed, you can download the BBPress WordPress Plugin here. in my case, i want to replace the ‘voice count’ with ‘view count’ in BBPress topics loop. voice counter should had been replace by view counter right now. Once everything is done, you should have view counter on all your BBPress topics. 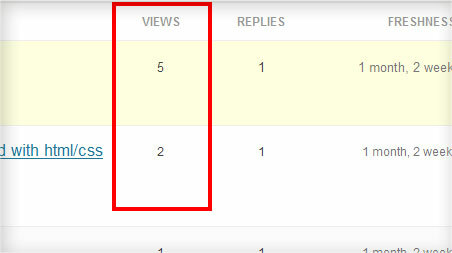 Now you can track which topics had the most viewed starting today! Hope you enjoy the read, more BBPress Tips and Tricks coming this month. Thanks, this is what I have been looking for… One question, though. My column header still says Voices, how do I change it to something more appropriate? i like what you did, but is it possible that i can put a limit to the view count? i min i have 5 members inside a group forum. so the view count would only be 5 also. please help. I don’t know ‘Add Hook Action to Each Topics’ and ‘Applying or use the counter in template’. How to do I?… Could you comment detail instruction ? I am a begginer of php(wordpress). Hello & thank you for this fantastic code to add a view counter. I do have one question. I have some threads that have 4 digit view counts, how can I get it to add a comma? Like 1,024 instead of 1024? Thank you for this tutorial! Just what I needed! Funny how BBPRess doesn’t have this piece of functionality out of the box.. Thanks for the tutorial. We’ve been wanting to do on our forum and your simple-to-implement method works flawlessly. We look forward to your upcoming bbpress tips & tricks.